Our Salvatore's Gift Cards are available at any Salvatore's location in any denomination. $15 Salvatore's Gift Cards are available at most Rochester area Wegmans locations as well! 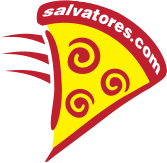 Salvatore's Gift Cards are also available online through GiftCardMall.com in $25, $50 or $100 denominations! Purchase either standard gift cards via USPS mail or electronic e-cards delivered via email! Salvatore's Gift Cards make great gifts for EVERYONE in your family. Holidays, or anytime, everyone loves to have a Salvatore's Gift Cardtucked away in their wallet. Makes a great gift for your co-workers and business associates as well! Yeah, we deliver that! Salvatore's Gift Cards are redeemable at all locations (except concessions at Blue Cross Arena, Frontier Field and CMAC). To check your card's remaining balance, please see last receipt, or call 1-877-654-6937 anytime. GIFT CARDS THAT TASTE GOOD ! !